Just this past week, I headed to the newest location of Fire Island Bakeshop in South Anchorage. The space is open and full of light, and the scent of rising yeast and baked goods full of promise always make me long for the foods of my childhood. So, it was perfect that South Carolina-born, James Beard-nominated head baker, Carlyle Watt, was there to reminisce with me about comfort foods. Carlyle's been in Alaska for 10 years and is also a founding member of beloved local band The Super Saturated Sugar Strings. We got to talking about tomatoes in all their late-summer glory and how we finally have truly satisfying locally grown love apples — firm, ripe, just tart enough — available through our local farmers. "At the bakery we buy hydroponic beefsteaks (tomatoes)," Carlyle told me. "From an auto glass guy-turned-tomato farmer in Wasilla. They taste fantastic! You want to just eat it like an apple!" And then talk turned to tomato-cheese pie, sun-warmed tomatoes thinly sliced on white bread with lots of mayo and cracked black pepper, and we eventually found our way to pimento cheese, that great spread known as the "pâté of the South." 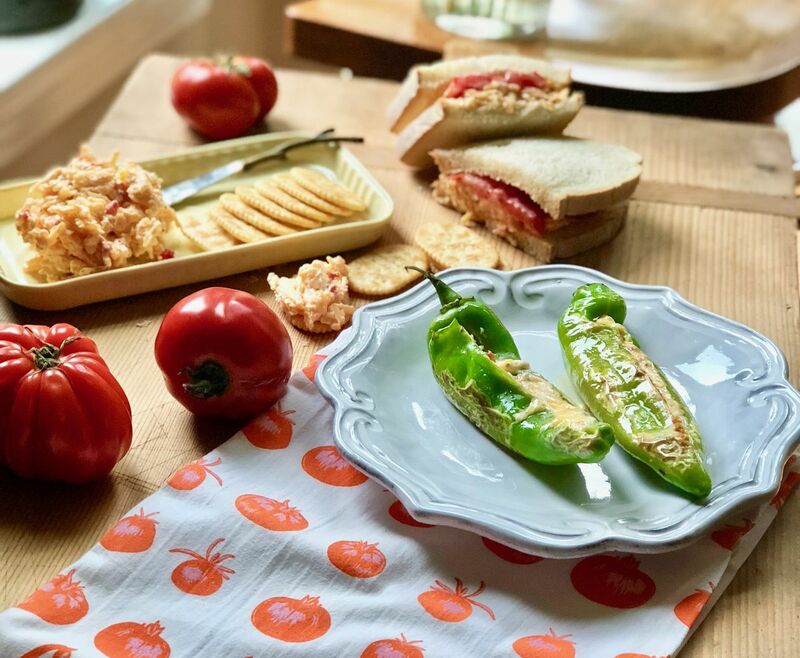 It's similar to Alaska's Kenai dip, but pimentos replace the hit of jalapeño or green chile; some variations do call for adding jalapeños or hot sauce. Only hand-grated cheddar will do, we both agreed. And lots of black pepper and just the right amount of mayo. We both miss Duke's brand but agreed that Best Foods makes a great stand-in. Carlyle offered to send his recipe for pimento cheese for me to test. Later that day, he sent me a message: "Thanks for giving me a reason to make this. It's so (expletive) good!" We can't always bring back our childhood foods, but what we can do is celebrate what we have locally with the flavors from our past. While experimenting with the pimento cheese, it inspired me to fry up 62 pieces of pickle-brined and buttermilk-marinated chicken for a celebratory business lunch, along with kimchi bacon macaroni and cheese and several bunches of braised turnip greens and collards from Rempel Farms. If you're not up to frying huge batches of chicken but want a taste of the South, try Carlyle's recipe. Some notes from Carlyle: This has got to be the simplest recipe for pimento cheese that I've seen, but it is hands-down the best. It happens to be based directly off my Uncle Hugh's recipe from my childhood. He instilled some basic pimento cheese tenets in me growing up that I believe separate a good one from a bad one: Only use orange extra sharp cheddar, never white, Tillamook is great. Never use a food processor to grate your cheese. Do it by hand. Use more black pepper than you think. 1. Hand grate the cheddar into a medium bowl; set aside. Combine mayonnaise, roasted pepper or pimentos, 1 tablespoon roasted pepper or pimento juice, vinegar, and pepper; stir to mix. This is important to do before adding the cheese so that you don't overmix and break up all of those nice long strands you created by hand-grating it. Gently fold in the cheddar. This is even better made a few hours ahead. Serve: with buttery crackers; on top of hamburgers; in omelets or frittatas; with celery sticks, on a BLT; layered into a savory tomato pie.